Too often, the garage is relegated into a storage room for items that are infrequently used or perhaps too large or unimportant for the home. However the garage is actually an important space in itself, and with proper organisation, can truly be a useful part of the home. A little effort and some creative nous can help you reclaim your garage, and even turn it into a productive place. The first step when attempting to organise your garage is to do some analysis. Look at what you currently have stored in your garage, and ask yourself why. Observe what’s used or needed frequently, and consider the types of things you currently use the garage for and the types of things that you’d like to be able to use the garage for. Once you’re aware of how you currently use your garage and how you’d like to use it, try to priorities certain things and activities. For example if you cycle every weekend, consider putting the bikes towards the front, or in an easily accessible place. If you go camping only once a year, then this gear can be put further down the list and stored a bit further out of the way since it’s not needed as often. The next step is to clear everything out of your garage. 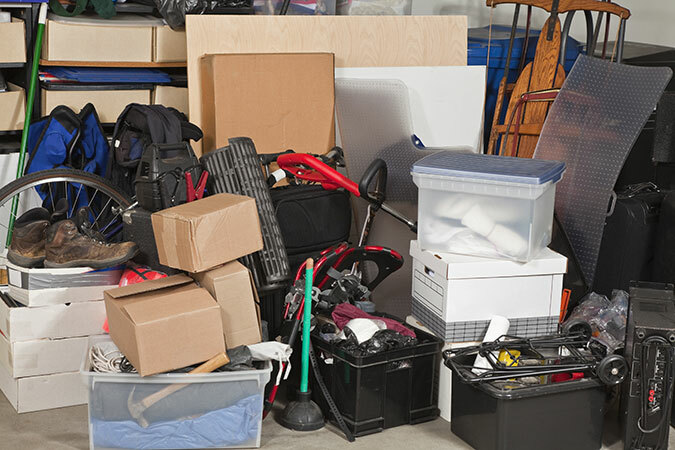 Remove all items and store them outside the garage, and lay it all out as this will help you to start organising. Once laid out, begin sorting through your items, paying particular attention to things that share something in common. For example, tools should be grouped together, camping gear together, and gardening products together. This is perhaps the most important way to achieve a clutter-free garage. Create a pile for items to throw away, donate, or sell. Work your way through your sorted piles and allocate everything accordingly. It’s important to be realistic here. For example, if you’ve been hanging on to a tent for five years and used it only once, consider that perhaps you don’t camp often enough to warrant keeping it. An optional but extremely helpful step is to map out zones in your garage. Use masking tape to mark where the cars should be, where storage can be installed, and how you might like to use the floor space. Organisation relies upon the efficient classification of items. This is where labels will come in extremely handy. Create a label for each general group of items that you’ll be storing together out of sight (for example, hiking gear, sporting equipment, and picnic sets). To maximise floor space you have available in your garage, the walls are an extremely important asset. Use peg boards, hooks, and other wall storage options to hang tools and other items that you need to be able to see. Bikes can also be mounted to walls. The ceiling is almost always neglected when it comes to the garage. However it provides valuable real estate for storing things such as rubber rafts, surfboards, and anything else that you can hoist up using a cable and pulley system. A lot of people like to spend time on their DIY projects, and the garage is an excellent place for this. If you have space, consider setting up a small workbench (perhaps underneath your wall of tools) where you can create to your heart’s content. Shelving is extremely important in a garage. From sophisticated shelving unit systems to simple wooden shelves or wire racks, this frees up floor space and allows the storage of almost anything. For example, sports equipment can be stored in plastic boxes that can be put on shelves. Where space permits, cabinets can provide a tidy way to store unsightly items, or those best left hidden such as poisonous garden products and pesticides. Where shelves show what’s on them, cabinets provide a much tidier facade and can even allow for even further organisation of items. Installing shelves, cabinets, and maximising floor space will also involve parking your cars rather precisely. A great way to make it easier to park in the exact desired spot is to hang a tennis ball on a piece of string from the ceiling and have it line up and touch the car’s windshield when it’s time to stop. This prevents bumping into objects with the front of the car, and allows you to maximise every inch of floor space in your garage without worrying about potential accidents. With so many ways to be creative and store items in your garage, there’s no excuse to not have an efficient space that’s more than just a repository of unwanted items. Reclaim your garage and be proud of what’s likely one of the largest parts of your home.